Objects from back in the old days are so great. They have character, quality and they look fantastic. 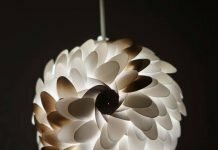 So if you would take such an item, upcycled it to let’s say a lamp, it would certainly stand out. To see what I’m talking about, take a look at the Blow Dryer Lamp by Lunch Lady Vintage and SEW ME Lamp by vanderBijl – design & interior. Two beautiful exemples. 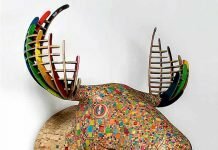 And now I want to show another superb upcycle design that made use of an old object. 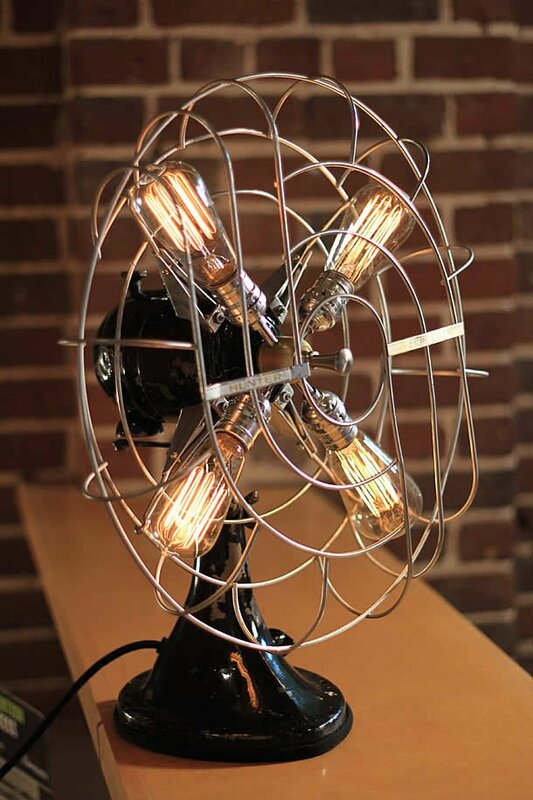 The ‘Vintage Fan Lamp‘ by Dan Cordero: “These desk fans date back pre-1950’s and each repurposed fan turned lamp has a distinct one of a kind look and feel. 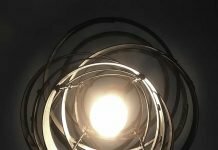 Each fan lamp creation goes through a time consuming and meticulous process of turning it into a piece of repurposed treasure. 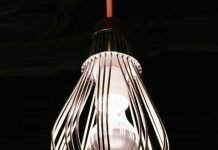 I’ll find you the perfect vintage fan and breathe new life into it by adding either 3 or 4 Vintage Edison Style Bulbs!” There’s a dimmer switch on the cord to adjust glow of all bulbs simultaneously. 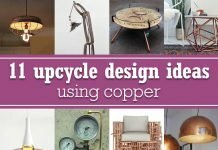 These upcycled designs are each a statement in their own way and do look good in any home or office. How to I make one of these? You could ask the designer, Dan Cordero. See the link in the post. Bonjour, puis-je trouver le concepteur ? 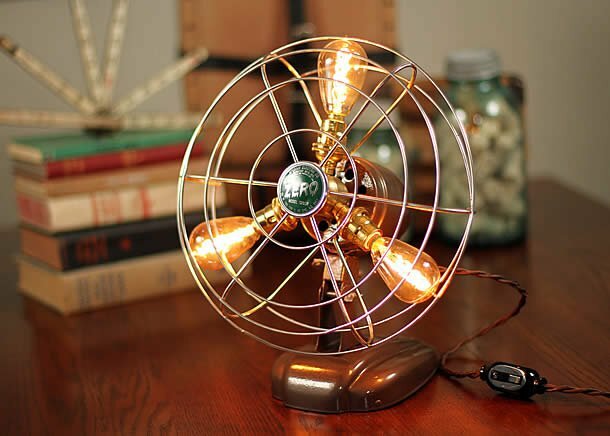 I LOVE LOVE LOVE this fan lamp! Great mind working there! Thanks for your comment. I agree, Dan Codero is very creative. Did you visit his online shop? Quite some nice work there!